The Elephant Juice folks, Corrina and JP, have now closed Dumbo to focus on the newly established One Feeds Two Foundation. The idea has taken hold, and then some. Corrina is also just about to turn thirty, in considerable style. These are causes well worthy of your attention. St Valentine’s Day: the perfect day to massacre a lovely, hearty bowl of asparagus soup from the Elephant Juice Soup Company, right? I thought so, too. George Square, where the elephantine van currently spends most of its lunchtimes, is on the outer edge of the zone where I’ll walk for a takeaway lunch. This is mainly because fifteen minutes is about as long as you can reasonably expect soup to retain its heat, particularly on a cold day. Also, a thirty minute round-trip is quite far enough at lunchtime, even for a committed walking enthusiast like me. I’ll go further if it’s a sit-down, as walking-off a good lunch is an unrivalled pleasure…but I digress. Further romantic tie-ins were provided from two further sources: firstly, the soup of the day, as previously mentioned, was asparagus “love” soup (it’s an aphrodisiac, of course); and secondly, the inspiration for their name comes from the fact that mouthing the words “Elephant Juice” is indistinguishable from saying “I love you”! And there’s lots of love to go around. One of Elephant Juice’s founding principles, aside from making damn good soup, is “one feeds two”: for every soup sold they’ll feed a hungry person in need. It’s the kind of simple and straightforward idea that you can see taking off and really taking hold. But, as they say, fine words butter no parsnips, nor do fine principles sate lunchtime tummy grumblings. 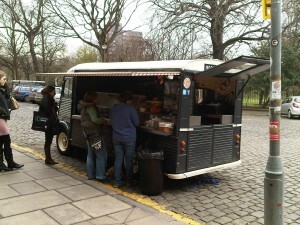 So, once I’d arrived in George Square, taken in the charming sight of “Dumbo” the soup van, I considered my choices. 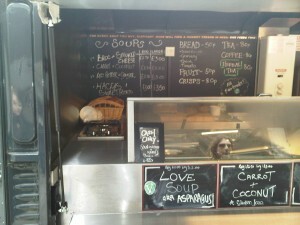 Today’s choice of four soups were red pepper and ginger, carrot and coconut, cullen skink, and the “love” soup. As it turned out, the girl in front of me in the queue settled my selection, as what she was having sounded good to me: “love” soup, accompanied by two generous wedges of tomato bread. Our genial host, Elephant Juice founder JP, told a tale of woe about one of his bain-maries being on the blink, but then produced a box of Milk Tray, a little complementary treat from which we could choose one, all in the name Valentinian romance. The service was friendly and inclusive, ensuring that I was sent on my way with a smile on my face. I toddled down the road to my office, pausing only to catch up with fellow Food Geek Jenny, whom I bumped into on Middle Meadow Walk. She was fresh from lunch at the excellent Hula. 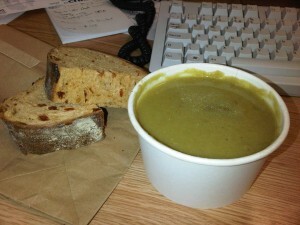 Once back at my desk, I tucked in to my soup. It was thick enough to hold a spoon to attention, beautifully flavoured, laced with many chunks of asparagus, and expertly seasoned with good strong notes of savoury pepper. It really was soup of the highest quality. The bread provided excellent accompaniment. It had a good firm crust and absorbent, flavour-packed crumb, making it the perfect partner. Overall, Elephant Juice made me very happy. Their soup was spectacularly good and the service extremely welcoming, with the wonderful “Dumbo” providing a quirky serving station. I can’t recommend the place highly enough to you. 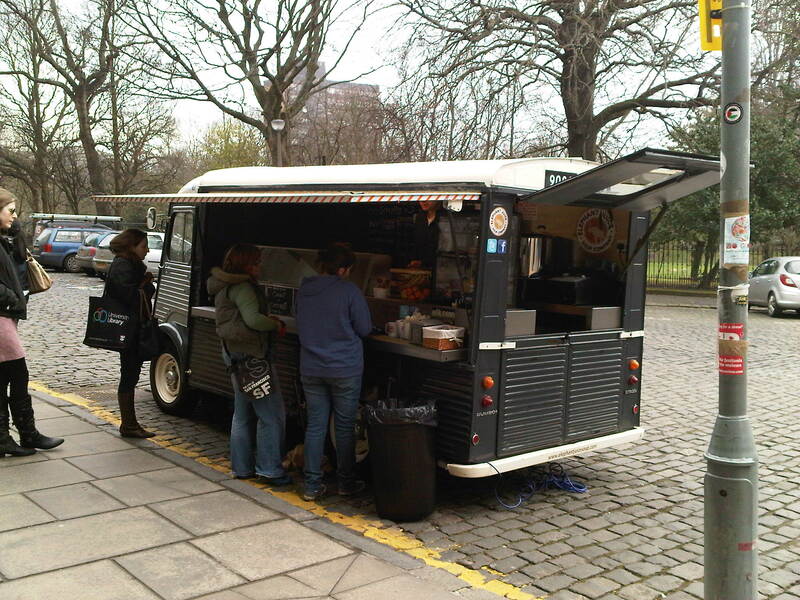 In the coming weeks and months, I think the intention is to take the van on the road, and offer their excellent fare in a range of venues across Edinburgh. I look forward to running in to Dumbo in new and unexpected places, very soon.